Hold on to your hats folks, Xiaomi just announced the Xiaomi Mi-Two - the first ever handset to use the Qualcomm Snapdragon APQ8064 S4 Pro chipset, which blew current mobile chipsets out of the water in early benchmarks. It's nothing like the early leak we saw. There's also an upgrade of their previous model, but we'll get to that in a moment. The Xiaomi Mi-Two is going to be the fastest smartphone on the market when it launches in October. We've seen dual-core Krait CPUs stand up to quad-core Cortex-A9 designs (Tegra 3, Exynos 4), but the APQ8064 chipset has four Krait cores, 2GB of RAM and Adreno 320 (over the Adreno 225 of current Snapdragon S4s). Xiaomi promises Xbox 360-like graphics performance and that might not just be PR talk. The screen on the Mi-Two will be a 4.3" IPS LCD with 720p resolution (342ppi), there will be an 8MP camera on the back (F/2.0 aperture, 26mm FoV), 1080p@30fps and 720p@90fps (yeah, that's right) video recording, MHL-enabled USB, HSPA+ capable of 42Mbps downlink and 16GB of built-in storage (no expandable storage, though). The standard battery is 2000mAh and there's an optional 3000mAh battery. 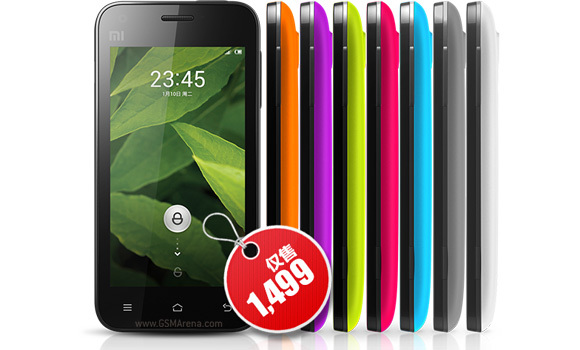 The Xiaomi Mi-Two measures 126mm x 62mm x 10.2mm. The phone will be priced RMB 1,999 ($315, €225), making the Xiaomi Mi-Two one of the cheapest quad-core (and even dual-core) smartphones out there. Now it's time to come back down to earth - we've avoided calling it an Android phone, because Xiaomi uses their heavily customized MIUI software, which is Android in an iOS mold. Still, the software is based on Android 4.1 Jelly Bean. The launcher features its own voice recognition, which is weird considering how good Google Now is. The second phone that Xiaomi announced today is the Xiaomi 1S, an update of the Mi-One. It will use a speedier 1.7GHz dual-core processor (Snapdragon S3 chipset), while the rest of the specs are the same as on its predecessor. This one will be priced RMB 1,499 ($235, €190) when it launches on August 23. The bad news is buying a Xiaomi phone outside China may prove quite the challange. We could only find the old one on Amazon.com, but costs more than double its new price of $204. "The launcher features its own voice recognition, which is weird considering how good Google Now is." oh come on, as an editor you should know that most Google services are not available in China.